Sennheiser partners with Adidas for sportproof earphones | What Hi-Fi? What's new? 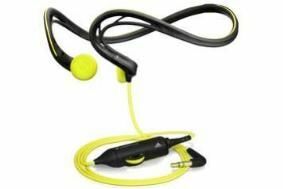 Well, the company says that while sportspeople use headphones a lot, standard designs 'are soon destroyed by corrosive sweat or physical damage and they rarely stay in place. Well, we hope he did more than bench-test them, but anyway... The new range is washable and sweat-proof, can be used in temperatures as low as -10C and in rain and snow, and is designed to stay in place whatever the usage. The headphones come with a variety of technologies to keep them going under stress. The cables are kevlar-reinforced to keep them flexible at low temperatures, and a new moisture protection system keeps out both the climate and the wearer's sweat. In addition the CX 680 ear-canal model, selling for £60, and the £35 MX680 in-ears, at £35, use a new EarFin system designed to adapt to the user's ear-shape, with various EarFins supplied for different ear sizes and shapes. These two models also share with the £43 OMX 680 ear-hook model ear-housings designed to fit into small ears, while the range is completed by US sprinter Tyson Gay's favourites, the £45 back-band-style PMX 680. For more details see the Sennheiser Adidas website.